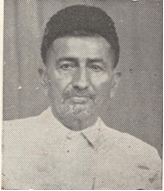 Mulla H aji Kassamalibhai Esmail Ebrahim Dossa was born in 1890 in Mumbai. He studied in Khan Habib School for 7 years in Gujrat. There, the religious teaching was being undertaken by Mulla Qader Hussayn Saheb such as Quran as well Urdu classes. 1n 1910 he visited Mumbai again and returned in 1911 to Mauritius. He then married an Indian Muslim daughter. The marriage was solemnized by an Aalim of Ahle Sunnat as there was no Shia Aalim available there during those days. (He continued to work as an agent up to 1930. In 1931 he decided to establish his own business of Kariyana (food stuff) which he was running well for quite a long time. In 1920 Mulla Saheb visited Mumbai with his wife, a son and a daughter. Over there his wife delivered a baby girl but unfortunately the baby passed away during infancy at the age of 8 months. In 1921 Kassamalibhai together with his wife and both children returned to Mauritius. By the grace of Almighty (swt) he was then blessed with 4 more daughters and 5 more sons whilst residing in Mauritius. The Jamaat performed all occasions, wafats and wiladats. The Dafan/Kafan rituals were carried out by Murrabi Alarakhia bhai Dewji. After his demise in 1914 his son Brother Fatehmohammed Alarakhia took over this work. After brother Fatehmohammed demise in 1920 Mulla Kassamali bhai had to shoulder these additional responsibilities as well. He obtained religious education from Mulla Qader Hussayn Saheb. He is a staunch follower of Ahlul Bayt (as) and kind hearted too. He served sincerely for many years. When members increased, a Jamaat was then established in 1960 and in the election Mulla Kassamali was elected as the first president of Mauritius Jamaat.